Around 12,000 people participate in a service at the Christian Fraternity of Guatemala church near Guatemala City. (CNN) -- Mega churches across the United States are becoming increasingly popular which is not only bringing thousands of worshippers together, but also billions of dollars in profit. From self-help books to CDs and DVDs, mega churches are becoming big money makers for the pastors and ministries they are a part of. 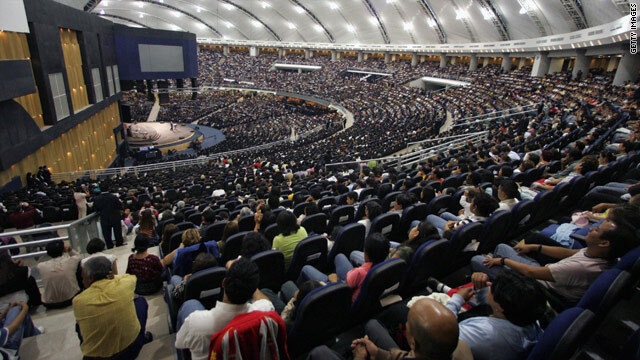 Mega churches are extra-large churches that can accommodate upwards of 15,000 people and are common among members of the evangelical Christian faith. Scott Thumma, professor of sociology and religion at Hartford Seminary told CNN that "the mega church on average has about $6.5 million in income a year." "If you put together all the mega churches in the United States, that's easily several billion dollars." Many ministers in the evangelical faith have become superstars in their own right -- Joel Osteen is one in particular. Osteen is a pastor at the Lakewood Church in Houston, Texas and his televised service reaches over seven million people each week across the United States and around the world. The Lakewood Church which Osteen is in charge of has a yearly budget of more than $80 million, but church officials deny that it's about money. "We hear the criticism a bit, but we don't hear it as much as you think we would," Donald Iloff Junior, advisor for Lakewood Church said. "One thing you find very absent is the asking of money and never once have we asked for money or donations on television." However, some critics argue that it's hard to be both a pastor and someone in charge of a yearly budget in the tens of millions. "When you have pastors thinking of themselves as CEOs, it's hard to tell the difference between a pastor and P-Diddy," Jonathan Walton, Assistant Professor of religious studies at the University of California Riverside told CNN. The way the sermon is told at these mega churches has also completely changed. "The plasma screen TVs have replaced crosses, Power Point-like presentations of the words of songs and liturgical practices have replaced the hymnals," Walton said. "This really resonates with a younger generation." The average age of a mega church worshipper is 40 years old -- 13 years younger than at a traditional church. Mega church worshippers tend to not only be younger, but also more diverse. "One thinks of them as a homogeneous group of white suburban American, but in fact when you go to most of the mega churches, you're going to find diversity of age, income and education levels," Thumma said. "You can also find racial diversity because in almost 30 percent of these mega churches across the country, you have 20 percent or more integration of ethnic groups so it really is quite staggering."